Botanical Name: Bambusa toldoides "Ventricosa Kimmei"
Maximum Culm Diameter: 2 1/2"
Water Requirements: Average. Water regularly, but don't over-water. Yellow Buddha's Belly bamboo is by far one of the most popular ornamental, collector's bamboos available. Its high adaptability and hardiness make it an excellent choice for numerous applications, such as privacy screening, hedges, windbreaks, indoor and outdoor container planting, bonsai and more. After the plant is well-established, it is also known to be extremely drought hardy and more tolerant to 'soggy' soil conditions than other varieties. This ornamental bamboo makes an amazing conversation piece, featuring variegated narrow leaves that emerge yellow and slowly turn to green as the year progresses. However, Kimmei Buddha Belly is most well-known for its tight-clumping form, gracefully arching canes that give the entire pant a vase-like shape and its amazingly beautiful canes, which emerge green and slowly fade to a golden-copper color with dark green 'painted' stripes. With a low canopy averaging about 3+ feet of clearance, this bamboo beautifully showcases their colorful canes and interesting foliage. However, for optimal appearances, you should trim and prune out the lower branches of the plant. As the name implies, this variation of Giant Buddha Belly Bamboo is also renowned for its swollen and bellied internodes. While many report that it seems to be more difficult to get this variation to 'belly out', with some stating that it's impossible, the general consensus is that this cultivar simply produces smaller bellies whenever it does belly out. Also, while it does produce zig-zagging culms, it produces more straight, slightly arched canes than anything. Yellow Buddha Belly is a highly versatile cultivar that is famed for a number of uses. From indoor ornamental specimens to privacy screens, Ventricosa Kimmei can adapt to a variety of conditions. Like most bamboos, the environment in which it is grown has a major effect on the growth expectations of the plant. For example, those that are grown indoors or in containers will remain much smaller than their outside, in-ground counterparts. However, there are 2 main uses for which Yellow Buddha Belly is most prized. When grown in pots, Ventricosa Kimmei will most likely average a height of 10 to 15 feet tall. The smaller the pot, the shorter in height you can expect your bamboo to be. However, like most clumping bamboo varieties, it will need to be re-potted every few years as it outgrows its container. Kimmei Buddha Belly is a perfect choice for a small indoor plant or ornamental bonsai. Its bright colors, unique culms and adaptability can liven up any office or indoor space. It has been known to adapt well to medium and high light indoor locations, and is easily stressed to produce bulging culms under these conditions. Smaller, indoor Kimmei plants are more likely to be persuaded into bellying out than larger outdoor plantings. Many people who choose Yellow Buddha Belly for indoor potted plants prefer to rotate it outdoors on a regular basis in order to ensure that it receives plenty of sunlight and fresh air. In large, outdoor containers it is not uncommon for Kimmei bamboo to reach heights of 15 feet or so, which makes it an excellent patio plant, yard centerpiece or screen. In areas that tend to experience colder winter temperatures and significant frost, it is not uncommon for the plant to be wintered indoors or in a protective building or shed. 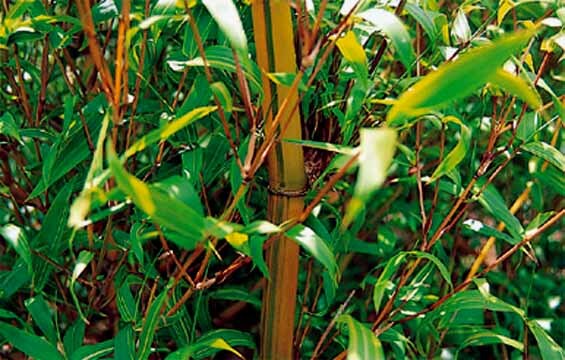 Due to its thick, tightly-clumping form, in addition to its colorful ornamental features, this bamboo makes a great choice for privacy screens and hedges. Like most bamboos, once a culm is cut it will never grow any taller. This makes it extremely easy to have a manageable screen that stays at the height you want with very little maintenance. In addition, the vase-like form of Kimmei creates a magnificent screen, especially in tight areas. By far, one of the most popular and commonly employed uses for Ventricosa Kimmei is as an ornamental centerpiece. This collector's bamboo can be carefully cultivated in a number of ways in order to create a spectacular cultivar that showcases both its swollen bellies and brightly colored foliage. Diligently pruning shoots, stressing for water and trimming lower branches gives the plant a stately and attractive appearance that is sure to improve any landscape. Similar to other bamboo varieties, Yellow Buddha Belly should be watered and fed regularly for at least the first year or two. However, once the plant has become well-established it is known to be drought resistant. It is also known to become more resistant to 'soggy' conditions as it matures. While Kimmei Buddha Belly has been known to survive temperatures down into the teens, but it is highly recommended that they be planted in regions that do not experience winter temperatures lower than 21 degrees Fahrenheit. They are also reported to be survivable in region 8a, however, special measures should probably be taken, such as mulching, covering or rotating indoors in order to ensure the plants survival.